Gilda Susan Radner (June 28, 1946 – May 20, 1989) was an American comedian and actress who was one of the seven original cast members for the NBC sketch comedy show Saturday Night Live (SNL). In her routines, Radner specialized in parodies of television stereotypes, such as advice specialists and news anchors, and in 1977, she won an Emmy Award for her performances on the show. She also portrayed those characters in her highly successful one-woman show on Broadway in 1979. Radner's SNL work established her as an iconic figure in the history of American comedy. She died from ovarian cancer in 1989. Her autobiography dealt frankly with her life, work, and personal struggles, including those with the illness. Her widower, Gene Wilder, carried out her personal wish that information about her illness would help other cancer victims, founding and inspiring organizations that emphasize early diagnosis, hereditary factors and support for cancer victims. She was posthumously awarded a Grammy Award in 1990. Radner was inducted into the Michigan Women's Hall of Fame in 1992; and she posthumously received a star on the Hollywood Walk of Fame in 2003. Radner was born in Detroit, Michigan, to Jewish parents, Henrietta (née Dworkin), a legal secretary, and Herman Radner, a businessman. Through her mother, Radner was a second cousin of business executive Steve Ballmer. She grew up in Detroit with a nanny, Elizabeth Clementine Gillies, whom she called "Dibby" (and on whom she based her famous character Emily Litella), and an older brother named Michael. She attended the exclusive University Liggett School in Detroit. Toward the end of her life, Radner wrote in her autobiography, It's Always Something, that during her childhood and young adulthood, she battled numerous eating disorders: "I coped with stress by having every possible eating disorder from the time I was nine years old. I have weighed as much as 160 pounds and as little as 93. When I was a kid, I overate constantly. My weight distressed my mother and she took me to a doctor who put me on Dexedrine diet pills when I was ten years old." Radner was close to her father, who operated Detroit's Seville Hotel, where many nightclub performers and actors stayed while performing in the city. He took her on trips to New York to see Broadway shows. As Radner wrote in It's Always Something, when she was 12, her father developed a brain tumor, and the symptoms began so suddenly that he told people his eyeglasses were too tight. Within days, he was bedridden and unable to communicate, and remained in that condition until his death two years later. Radner graduated from Liggett and enrolled at the University of Michigan at Ann Arbor in 1964. In Ann Arbor, Radner dropped out in her senior year to follow her boyfriend, Canadian sculptor Jeffrey Rubinoff, to Toronto, where she made her professional acting debut in the 1972 production of Godspell with future stars Eugene Levy, Andrea Martin, Victor Garber, Martin Short, and Paul Shaffer. Afterward, Radner joined The Second City comedy troupe in Toronto. Radner was a featured player on the National Lampoon Radio Hour, a comedy program syndicated to some 600 U.S. radio stations from 1974 to 1975. Fellow cast members included John Belushi, Chevy Chase, Richard Belzer, Bill Murray, Brian Doyle-Murray, and Rhonda Coullet. 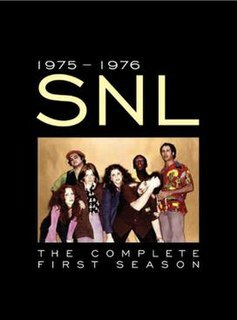 Radner gained name recognition as one of the original "Not Ready for Prime Time Players", the freshman group on the first (1975) season of Saturday Night Live. She was the first performer cast for the show, co-wrote much of the material that she performed, and collaborated with Alan Zweibel (of the show's writing staff) on sketches that highlighted her recurring characters. Between 1975 and 1980, she created characters such as obnoxious personal advice expert Roseanne Roseannadanna and "Baba Wawa", a parody of Barbara Walters. After Radner's death, Walters stated in an interview that Radner was the "first person to make fun of news anchors, now it's done all the time." "Of the three female cast members [SNL], Gilda Radner made the deepest impact. There is hardly a female sketch comic today who does not claim Radner as an inspiration for her comedy career." She also played the character Emily Litella, an elderly, hearing-impaired woman who gave angry and misinformed editorial replies on "Weekend Update". Additionally, Radner parodied celebrities such as Lucille Ball, Patti Smith, and Olga Korbut in SNL sketches. She won an Emmy Award in 1978 for her work on SNL. In Rolling Stone's February 2015 appraisal of all 141 SNL cast members to date, Radner was ranked ninth in importance. "[Radner was] the most beloved of the original cast," they wrote. "In the years between Mary Tyler Moore and Seinfeld's Elaine, Radner was the prototype for the brainy city girl with a bundle of neuroses." Radner battled bulimia while on the show. She had a relationship with SNL castmate Bill Murray, with whom she worked at the National Lampoon, which ended badly. Few details of their relationship or its end were made public. In It's Always Something, this is the one reference Radner made to Murray in the entire book: "All the guys [in the National Lampoon group of writers and performers] liked to have me around because I would laugh at them till I peed in my pants and tears rolled out of my eyes. We worked together for a couple of years creating The National Lampoon Show, writing The National Lampoon Radio Hour, and even working on stuff for the magazine. Bill Murray joined the show and Richard Belzer ..."
In 1979, incoming NBC President Fred Silverman offered Radner her own primetime variety show, which she turned down. That year, she was a host of the Music for UNICEF Concert at the United Nations General Assembly. Alan Zweibel, who co-created the Roseanne Roseannadanna character and co-wrote Roseanne's dialogue, recalled that Radner, one of three original SNL cast members who stayed away from cocaine, chastised him for abusing it. While in character as Roseanne Roseannadanna, Radner gave the commencement address to the graduating class at the Columbia School of Journalism in 1979. Radner had mixed emotions about the fans and strangers who recognized her in public. She sometimes became "angry when she was approached [by strangers in public], and upset when she wasn't," according to the book by Hill and Weingrad. In 1979, Radner appeared on Broadway in the successful one-woman show, Gilda Radner - Live From New York. The show featured material that was racier than NBC censors allowed on Saturday Night Live, such as the song "Let's Talk Dirty to the Animals". In 1979, shortly before Radner's final season on Saturday Night Live, her Broadway show was filmed by Mike Nichols under the title Gilda Live, co-starring Paul Shaffer and Don Novello, and the movie was released in theaters nationwide in 1980, with poor results. A soundtrack album was also unsuccessful. During the Broadway production, Radner met her first husband, G. E. Smith, a musician who worked on the show. They were married in a civil ceremony in 1980. In the fall of 1980, after all original SNL cast members departed from the show, Radner began working with actor Sam Waterston in the Jean Kerr play Lunch Hour. They played two people whose spouses are having an affair, and as a reaction they start their own relationship consisting of trysts on their lunch hour. The show ran for more than seven months in various theaters in the United States, including the John F. Kennedy Center for the Performing Arts in Washington, D.C. Newspaper critics, including Tom Shales, praised the play and Radner's performance in it. Radner and Smith divorced in 1982. Radner met actor Gene Wilder on the set of the Sidney Poitier film Hanky Panky (released in 1982), when the two worked together making the film. She described their first meeting as "love at first sight". She was unable to control her attraction to Wilder as her marriage to guitarist G. E. Smith deteriorated. Radner went on to make a second film with Wilder, The Woman in Red (released in 1984), and their relationship grew. The two were married on September 18, 1984, in Saint-Tropez. The pair made a third film together, Haunted Honeymoon (released in 1986) and remained married until her death in 1989. Details of Radner's eating disorder were reported in a book about Saturday Night Live by Doug Hill and Jeff Weingrad, The book by Hill and Weingrad was published and received much media coverage during a period when Radner was consulting various doctors in Los Angeles about her symptoms of illness that turned out to be cancer. In 1985, Radner was experiencing severe fatigue and suffered from pain in her upper legs on the set of Haunted Honeymoon in the United Kingdom. She sought medical treatment, and for a period of 10 months, various doctors, most of them in Los Angeles, gave her several diagnoses that all turned out to be wrong because she continued to experience pain. On July 26 , Haunted Honeymoon opened nationwide. It was a bomb. One month of publicity and the movie was only in the theaters for a week – a box-office disaster. Finally, on October 21, 1986, Radner was diagnosed with stage IV ovarian cancer. "She immediately underwent surgery and had a hysterectomy," wrote Jenny Song in a 2009 magazine article published by the American Association for Cancer Research. On October 26, "surgeons removed a grapefruit-size tumor from her abdomen," the article continued. Radner then began chemotherapy and radiation therapy treatment, as she wrote in It's Always Something, and the treatment caused extreme physical and emotional pain. They found an old photo of me looking frightened from a 'Saturday Night Live' sketch and blew that up to make the point. What they did probably sold newspapers, but it had a devastating effect on my family and my friends. It forced Gene [Wilder] to compose a press release to respond. He said that I had been diagnosed with ovarian cancer, had had surgery, and my prognosis was good. The Enquirer doesn't like good news, so the Gilda Radner story stopped running. Four months after her ordeal with the National Enquirer, Radner saw her Saturday Night Live castmates one last time at Laraine Newman's 35th birthday party (in March 1987). According to Bill Murray when he heard she was leaving the party, he and Dan Aykroyd carried her around the Los Angeles house where the party was held, repeatedly saying goodbye to everyone. Since all the guests were comedians, they all did comedy bits with her repeatedly. After Radner was told that she had gone into remission, she wrote It's Always Something (a catchphrase of her character Roseanne Roseannadanna's), which included details of her struggle with the illness. Life did a March 1988 cover story on her illness, titled "Gilda Radner's Answer to Cancer: Healing the Body with Mind and Heart." In 1988, Radner guest-starred on It's Garry Shandling's Show on Fox TV, to critical acclaim. When Shandling asked her why she had not been seen in public for a while, she replied, "Oh, I had cancer. What did you have?" Shandling's reply: "A very bad series of career moves ... which, by the way, there's no treatment for whatsoever." She repeated on-camera Mark Twain's apocryphal saying, "Reports of my death are greatly exaggerated." Radner planned to host an episode of Saturday Night Live that year, but a writers' strike caused the delay of the network television season. In September 1988, after tests showed no signs of cancer, Radner went on a maintenance chemotherapy treatment to prolong her remission, but three months later, in December, she learned the cancer had returned. She was admitted to Cedars-Sinai Medical Center in Los Angeles on May 17, 1989, to undergo a CT scan. She was given a sedative and went into a coma during the scan. She did not regain consciousness and died three days later, from ovarian cancer on May 20, 1989; Wilder was at her side. News of her death broke as Steve Martin was rehearsing to act as the guest host for that night's season finale of Saturday Night Live. The show's performers and crew, including Lorne Michaels, Phil Hartman, and Mike Myers (who had, in his own words, "fallen in love" with Radner after playing her son in a BC Hydro commercial on Canadian television and considered her the reason he wanted to be on SNL), had not known how grave her situation was. Martin's planned opening monologue was scrapped; in its place Martin, in tears, introduced a video clip of a 1978 sketch in which he and Radner had parodied Fred Astaire and Cyd Charisse in a well-known dance routine from The Band Wagon (1953). After the clip, Martin said it reminded him of "how great she was and of how young I looked. Gilda, we miss you." 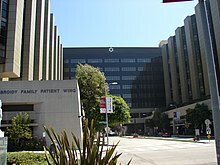 Wilder established the Gilda Radner Hereditary Cancer Program at Cedars-Sinai to screen high-risk candidates (such as women of Ashkenazi Jewish descent) and to run basic diagnostic tests. He testified before a Congressional committee that Radner's condition had been misdiagnosed and that if doctors had inquired more deeply into her family background they would have learned that her grandmother, aunt, and cousin all died of ovarian cancer, and therefore they might have attacked the disease earlier. Radner's death helped raise awareness of early detection of ovarian cancer and the connection to familial epidemiology. The media attention in the two years after Radner's death led to registry of 450 families with familial ovarian cancer at the Familial Ovarian Cancer Registry, a research database registry at the Roswell Park Cancer Institute in Buffalo, New York. The registry was later renamed the Gilda Radner Familial Ovarian Cancer Registry (GRFOCR). In 1996, Gene Wilder and Registry founder Steven Piver, one of Radner's medical consultants, published Gilda's Disease: Sharing Personal Experiences and a Medical Perspective on Ovarian Cancer. In 1991, Gilda's Club, a network of affiliate clubhouses where people living with cancer, their friends, and families, can meet to learn how to live with cancer, was founded by Joanna Bull, Radner's cancer psychotherapist, along with Radner's widower, Gene Wilder (also a cancer survivor) and broadcaster Joel Siegel (who later died after a long battle with cancer). The first club opened in New York City in 1995. The organization took its name from Radner's comment that cancer gave her "membership to an elite club I'd rather not belong to". Radner's story can be read in her book, It's Always Something. Many Gilda's Clubs have opened across the United States and in Canada. In July 2009, Gilda's Club Worldwide merged with The Wellness Community, another established cancer support organization; the name Cancer Support Community (CSC) was legally adopted in 2011 by the merged organization. As of 2012, more than 20 local affiliates of Gilda's Club were active. Although some local affiliates of Gilda's Club and The Wellness Community have retained their names, many affiliates have adopted the name Cancer Support Community following the merger. In 2002, the ABC television network aired a television movie about her life: Gilda Radner: It's Always Something, starring Jami Gertz as Radner. In 2007, Radner was featured in Making Trouble, a film tribute to female Jewish comedians, produced by the Jewish Women's Archive. Radner makes two comic book appearances. DC Comics Young Love #122 in 1976 and Marvel Team-Up #74 from 1978. Radner won an Emmy Award for "Outstanding Continuing or Single Performance by a Supporting Actress in Variety or Music" for her performance on Saturday Night Live in 1977. She posthumously won a Grammy Award for "Best Spoken Word Or Non-Musical Recording" in 1990. In 1992, Radner was inducted into the Michigan Women's Hall of Fame for her achievements in arts and entertainment. Through the generosity of many who participated in the 2002 ABC special, "Gilda Radner's Greatest Moments," (including Lynda Carter, Victor Garber, Eric Idle, David Letterman, Eugene Levy, Peter Mann, Steve Martin, Mike Myers, Paul Shaffer, Lily Tomlin and The Jim Henson Company), producer/actor James Tumminia spearheaded a campaign to dedicate a posthumous star on the Hollywood Walk of Fame to Gilda. On June 27, 2003, Gilda received her star on the Hollywood Walk of Fame at 6801 Hollywood Blvd. "Saturday Night Live" alumna Molly Shannon (and the host of the ABC special) served as Master of Ceremonies at the induction ceremony at which Laraine Newman, Gilda's Club founder Joanna Bull and Gilda's brother Michael F. Radner appeared to present the honor. Parts of West Houston Street in New York City, Lombard Street in Toronto, Kirk Road in Warminster, Pennsylvania, and Chester Avenue in White Plains, New York, have been renamed "Gilda Radner Way". ^ "Fighting for Life". Los Angeles Daily News. July 11, 1989. ^ "Gilda Radner profile". Film Reference. Retrieved March 11, 2009. ^ "Business - Microsoft's Heir Apparent -- Steve Ballmer - Seattle Times Newspaper". community.seattletimes.nwsource.com. ^ "Michaels and Radner talk SNL". 90 Minutes Live. CBC Television. February 2, 1978. Retrieved January 24, 2009. ^ Radner, Gilda (1989). It's Always Something. New York: Simon and Schuster. p. 97. ^ Saltman, David (1992). Gilda: An Intimate Portrait. Chicago: Contemporary Books. ^ a b c d Hevesi, Dennis (May 21, 1989). "Gilda Radner, 42, Comic Original Of 'Saturday Night Live' Zaniness". The New York Times. ^ a b Radner, Gilda (1989). It's Always Something. New York: Simon and Schuster. p. 99. ^ a b c d e f g h i j k l m n o Radner, Gilda (1989). It's Always Something. New York: Simon & Schuster. ^ a b "'The National Lampoon Radio Hour'". NPR.org. Retrieved March 13, 2017. ^ a b Zweibel, Alan (1994). Bunny Bunny: Gilda Radner. New York: Villard. ^ Kohen, Yael (2012). We Killed: The Rise of Women in American Comedy. Macmillan. pp. 107–108. ^ "SNL cast members". Rolling Stone (1229). February 26, 2015. p. 32. ^ Radner, Gilda (1989). It's Always Something. New York: Simon and Schuster. pp. 100–101. ^ Rockwell, John (January 10, 1979). "Pop: Stars Join to Tape Benefit for UNICEF". The New York Times. ISSN 0362-4331. Retrieved February 23, 2019. ^ "-journalist FIGHTclub". Journalist Fight Club. ^ a b c Hill, Doug and Jeff Weingrad. Saturday Night: A Backstage History of Saturday Night Live. New York: Beech Tree Books. 1986. ^ Hischak, Thomas S. (2001). American Theatre: A Chronicle of Comedy and Drama, 1969–2000. Oxford University Press. ISBN 0-19-512347-6. ^ Shales, Tom (October 3, 1980). "Good as Gilda". Washington Post. ISSN 0190-8286. Retrieved January 30, 2018. ^ a b c Song, Jenny (Spring 2009). "America's Funny Girl". CRMagazine.org. ^ Shales, Tom (2010). Live From New York: An Uncensored History Of Saturday Night Live. ISBN 0-316-73565-5. ^ "Mark Twain on Coldest Winter". Snopes.com. September 26, 2007. Retrieved June 8, 2012. ^ Karras, Steve (January 6, 2013). 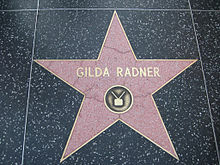 "Gilda Radner Remembered". Huffington Post. Retrieved April 3, 2018. ^ "Mike Myers biography". Talktalk.co.uk. Retrieved July 26, 2014. ^ "Hereditary Cancer Program (Gilda Radner Hereditary Cancer Program) - Cedars-Sinai". ^ Wilder, Gene. "Why Did Gilda Die?" People Magazine, June 3, 1991. ^ Squires, Sally. "Fighting Ovarian Cancer: Doctors Don't Know Who Is At Risk and Why", Washington Post, May 30, 1989. ^ Gilda Radner Familial Ovarian Cancer Registry website; accessed March 19, 2015. ^ "Gilda's Club Twin Cities: Who We Are". Website. gildasclubtwincities.org. Retrieved November 28, 2012. ^ "Wellness Community & Gilda's Club May Merge". Oncology Times vol 31, Issue 7. pp. 8–10. Retrieved November 28, 2012. ^ McClure, Susan (December 14, 2009). "Gilda's Club and The Wellness Community Join Forces". Archived from the original on December 7, 2012. Retrieved November 28, 2012. ^ "Merging to Increase Mission Impact". The NonProfit Times. Archived from the original on December 7, 2012. Retrieved November 28, 2012. Laraine Newman is an American comedian, actress, voice artist, and writer who was part of the original cast of NBC's Saturday Night Live. Jerome Silberman, known professionally as Gene Wilder, was an American actor, screenwriter, director, producer, singer-songwriter and author. 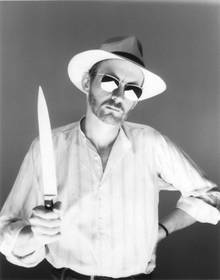 Michael O'Donoghue was an American writer and performer. He was known for his dark and destructive style of comedy and humor, was a major contributor to National Lampoon magazine, and was the first head writer of Saturday Night Live. He was also the first performer to utter a line on that series. Emily Litella is a fictional character created and performed by comedian Gilda Radner in a series of appearances on Saturday Night Live. Based on a person in her early life, Emily Litella is a popular character in Radner's comedy repertoire. 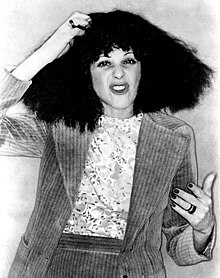 Roseanne Roseannadanna is one of several recurring characters created and portrayed by Gilda Radner on Weekend Update in the early seasons of Saturday Night Live (SNL). She was the segment's consumer affairs reporter who, like an earlier Radner character Emily Litella, editorialized on current issues, only to go off-topic before being interrupted by the anchor. Unlike Litella's meek and apologetic character, Roseannadanna was brash and tactless. The character was based on Rose Ann Scamardella, a former anchorwoman on WABC-TV's Eyewitness News in New York City. The character also appeared later in Radner's live one-woman shows. Haunted Honeymoon is a 1986 American comedy horror film starring Gene Wilder, Gilda Radner, Dom DeLuise and Jonathan Pryce. Wilder also served as writer and director. The film also marked Radner's final appearance prior to her death of ovarian cancer in 1989. The title Haunted Honeymoon was previously used for the 1940 U.S. release of Busman's Honeymoon based on the stage play by Dorothy L. Sayers. Gilda's Club is a community organization for people with cancer, their families and friends. Local chapters provide meeting places where those who have cancer, their families, and friends can join with others to build emotional and social support as a supplement to medical care. Free of charge and nonprofit, Gilda's Club chapters offer support and networking groups, lectures, workshops and social events in a nonresidential, homelike setting. The club was named in tribute to an original Saturday Night Live cast member Gilda Radner, who died of ovarian cancer in 1989. In 2009, Gilda's Club merged with The Wellness Community to form the Cancer Support Community, although local branches generally opted to retain the name Gilda's Club. Anne Beatts is an American comedy writer. Alan Zweibel is an American producer and writer who has worked on such productions as Saturday Night Live, PBS' Great Performances, and It's Garry Shandling's Show. Gilda Live is a 1980 American comedy documentary film starring Gilda Radner, directed by Mike Nichols and produced by Lorne Michaels. Radner and Michaels and all of the writers involved with the production were alumni from the television program Saturday Night Live. The fourteenth season of Saturday Night Live, an American sketch comedy series, originally aired in the United States on NBC between October 8, 1988 and May 20, 1989.